JUST HOW WELL DO YOU KNOW YOURSELF? Every worthwhile endeavor in life can be enhanced and exponentially deepened when you are in touch with your innermost self. 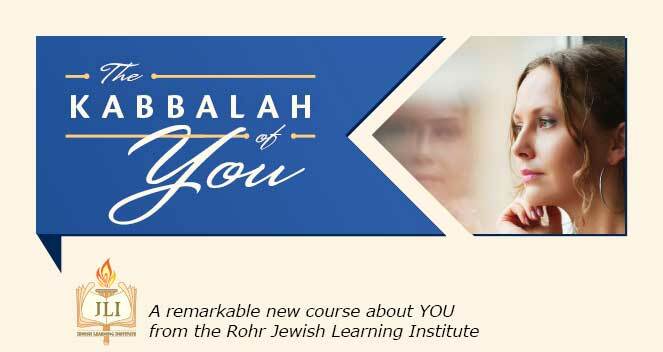 The inspiration and wisdom of The Kabbalah of You will help you encounter your deepest core and forge your own path to fulfillment. Rich with humor, insight, compassion—and absolute honesty—this course is a map to help you handle anything life throws your way. What does it mean to be human? The Jewish mystics teach us that we are nothing less than “Divinity in disguise.“ Then why, so often, do we not feel that way? Discover the power of your soul and its boundless force that is waiting to be unleashed. What kind of life are you creating for yourself? Why is it so difficult to act upon your deepest convictions? The dissonance between what we believe and how we behave can be frustrating and even paralyzing. Explore ways to make what you do a reflection of who you are. We continue to pursue external sources of happiness, even while we know that happiness must come from within. How do you tell the difference between what you want and what you need? How do you express who you truly are? Find out why there’s so much more to joy than just being happy. In an age of hard facts, is faith still relevant? We insist on rational answers to our questions, but are those answers the foundation of our faith? Is faith a blind leap, or the result of an intellectual pursuit? Learn how to access your inner faith. Can you love another person if you don’t love yourself? Can you love a complete stranger? Discover why you cannot be true to yourself without connecting with the part of you that is one with others. What’s better than perfect? Imperfection. We can all be better than perfect—if we struggle to be the best we can. Understand how the heightened passion and thirst of one who grapples in the dark can more than compensate for the failings of imperfection. craft a more meaningful life. psychological health and personal growth.